Home > Blog > Answering the Call to "Feed My Sheep"
Answering the Call to "Feed My Sheep"
In yesterday's blog post from Ellen Dollar, she quite eloquently (as usual) articulated both the Christian need and desire to help those for whom life is more difficult. Those of you who know me know that I feel very strongly that one of the primary ways we are called by Jesus to do this is by addressing the basic human need for proper and abundant nutrition. As Jesus reminds Peter; if we love him we will "feed his sheep." While this answer may have deep and abiding spiritual implications, I believe very strongly that Jesus' ministry shows us that he is also talking in the literal. Sometimes when we want to reach somebody's heart, we first need to fill their bellies. We all know that a hungry child has more difficulty learning in school than a full one. This practice of making feeding others an integrated part of our day, of our corporate worship and of our children's lives would not only have a practical application of actually feeding people, it would instill in our children and each other the Gospel value of caring for others. Beginning today, there will be receptacles around the church for you to place your nonperishable foods to be distributed through the West Hartford Food Pantry, the Hartford Catholic Worker and here at St. James's to those coming to us hungry and need of something to eat. I look forward to this being the beginning of something big and long practiced in the life of this parish and the lives of its members. The Rev. 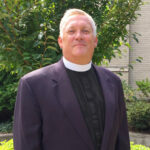 Bob Hooper is the rector of St. James’s Episcopal Church. He blogs for St. James’s most Tuesdays, reflecting on the community, parish life and (being Rector) anything else he likes.